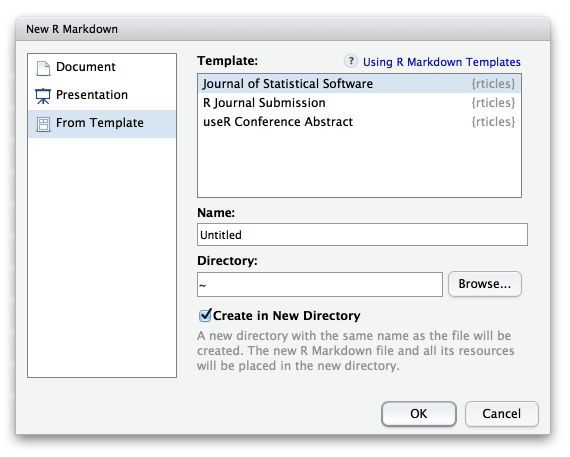 A suite of custom R Markdown formats and templates for authoring journal articles and conference submissions. Under the hood, LaTeX templates are used to ensure that documents conform precisely to submission standards. At the same time, composition and formatting can be done using lightweight markdown syntax, and R code and its output can be seamlessly included using knitr. Using rticles requires the prerequisites described below. You can get most of these automatically by installing the latest release of RStudio (instructions for using rticles without RStudio are also provided). Added the template for the Frontiers Journals (@muschellij2, @zkamvar, #209). Added the template for the AGU Journals (thanks, @eliocamp, #199). Updated the template for PLOS to version 3.5 (thanks, @uvesten, #196). No longer hardcode the LaTeX engine to xelatex in rsos_article() (thanks, @bensprung, #198). Added an argument pandoc_args to ieee_article() so that users can pass custom Pandoc arguments. This also makes it work with bookdown::pdf_book() (thanks, @espinielli, #206). The base_format argument has been removed from peerj_article() (#127) and copernicus_article() (#172). This argument was originally added mainly for supporting bookdown::pdf_book(), but you should really pass these formats to the base_format argument of bookdown::pdf_book instead of the other way around. For output formats acm_article(), acs_article(), ams_article(), mnras_article(), the csl file should be specified as a top-level option in the YAML header of the document (this has been done in the R Markdown templates). It is no longer specified automatically by the output format functions. The function ctex_template() was removed. If you need to use a custom LaTeX template for the ctex output format, just use the template option under ctex. Added the template for the SAGE Journals (thanks, @oguzhanogreden, #181). Added the template for Biometrics (thanks, @daltonhance, #170). Added the template for Copernicus Publications journals (thanks, @nuest, #172). Supports syntax highlighting in the ieee_article() and acm_article() formats (thanks, @rainer-rq-koelle, #182). Disabled syntax highlighting for rjournal_article() (thanks, @eddelbuettel, #185). Added the template for the IEEE Transaction Journals (thanks, @Emaasit, #97). Added the PeerJ format (thanks, @zkamvar, #127). Added a template for the Royal Society Open Science Journal (thanks, @ThierryO, #135). Added a template for Bulletin de l'AMQ (thanks, @desautm, #145). Added the MDPI journal template (thanks, @dleutnant, #147). Added the Springer Journal Article template (thanks, @strakaps, #164). Added the template for MNRAS (Monthly Notices of the Royal Astronomical Society) articles (thanks, @oleskiewicz, #175). Fixed #6, #10, #49, #132, and #149: dollar signs and other special LaTeX characters such as ^ can be used in code chunks in JSS and R Journal articles now, but Pandoc 2.x will be required (you can use the Preview version of RStudio if you do not want to install Pandoc separately). Fixed #9: special characters such as spaces and underscores can be used in Rmd filenames for R Journal articles now. Fixed #71: bibliography is supported for The R Journal articles now. Supports breaking the JSS author list into multiple lines; see #100 for details.